Sepsis is a clinical syndrome which complicates severe infection. In sepsis there is cardinal signs of inflammation that is vasodilation, leukocyte accumulation, increased microvascular permeability. This signs are seen in tissues that are remote from the infection. Systemic inflammatory response syndrome (SIRS) is a similar clinical syndrome that is seen in association with noninfectious insult such as acute pancreatitis, pulmonary contusion. The basic abnormality in sepsis and SIRS is dysregulation of the inflammatory response there may be a massive and uncontrolled release of proinflammatory mediators which initiates a chain of events that lead to widespread tissue injury. This will lead to multiple organ dysfunction syndrome (MODS), which results in high mortality associated with these syndromes. 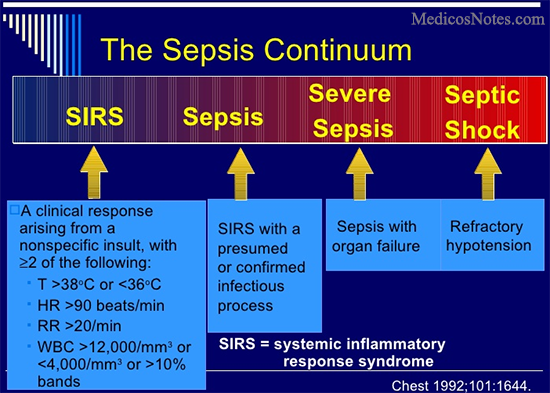 Multiple organ dysfunction syndrome is the end of the severity of illness spectrum of both SIRS and sepsis. MODS is classified as primary or secondary. Following are the features of Primary MODS. Primary MODS is the result of a well-defined insult. In this condition organ dysfunction occurs early. The organ dysfunction may be directly due to the insult itself (eg, renal dysfunction due to rhabdomyolysis). PaO 2 /FiO 2 ratio. Serum creatinine (or urine output).